Hamilton Beach Food Steamer Just $29.47! Down From $46! PLUS FREE Shipping! 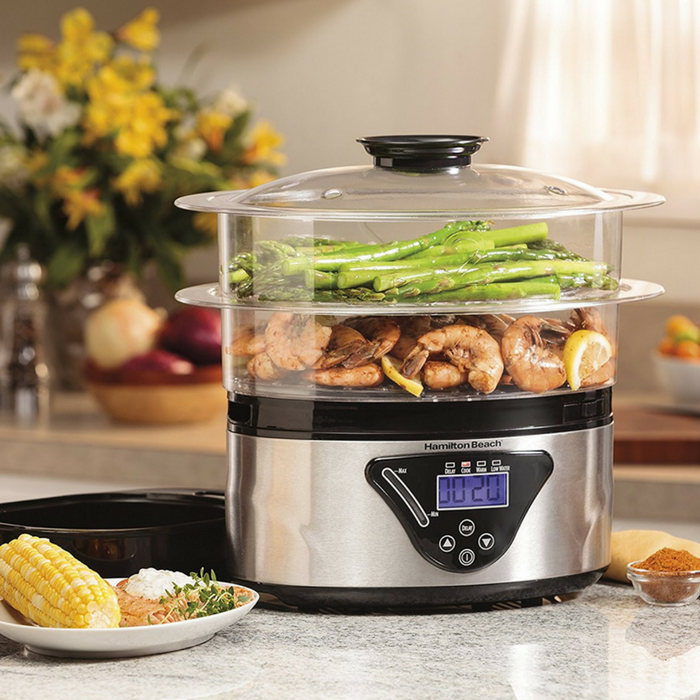 You are here: Home / Great Deals / Amazon Deals / Hamilton Beach Food Steamer Just $29.47! Down From $46! PLUS FREE Shipping! Head over to Amazon to score the Hamilton Beach Food Steamer for just $29.47 down from $45.99 PLUS FREE shipping! Make mealtime more exciting and your plate more nutritionally balanced with colorful, vitamin-packed foods. It’s easy with the Hamilton BeachDigital Steamer. Add your choice of vegetables, seafood, or chicken breasts and you’re minutes away from serving a satisfying steamed meal the whole family will enjoy. With a Food Steamer in your kitchen, you can take advantage of the bounty of healthy, in-season produce at your local farmer’s market or grocery store.